The mini bus picked us up from the hotel and dropped us off at Llanddona. Today we were to walk in reverse back to Beaumaris. Soon after leaving the car park the path rose to the Iron Age hill fort of Din Silway and Bwrdd Arthur (Arthur’s Table) from which we had views over to the Welsh mainland. 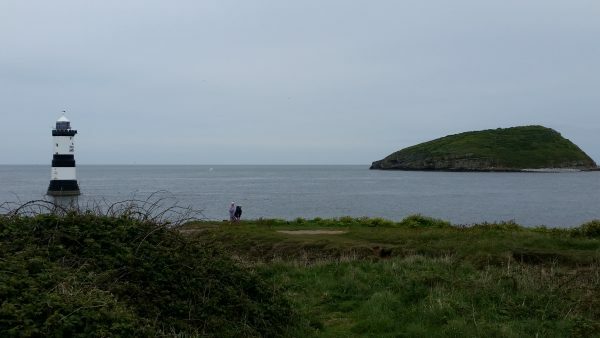 The walk then continued on an inland path to Penmon Point. (Note: since we walked this section, a new path has opened closer to the coast). There is a lighthouse at Penmon Point and a good view of Puffin Island. After lunch we continued down the coast path but at Lleniog we had to take an inland route due to the tide being in.. We rejoined the coast at Fryars Bay then walked into Beaumaris to catch the bus back to the hotel.